In some posts on this blog I make a big deal about things like “error” and “uncertainty”; I’ve used these terms when describing points on a map that are generated from a GPS, and in describing statistics pertaining to accidents and injuries in Search and Rescue. I was recently reading this post about that language of scientific communication, and how the general public might interpret such terms. It’s quite enlightening, especially in light of the Climategate scandal of a few years ago (where, it’s important to say, no evidence of any wrongdoing was ever found). 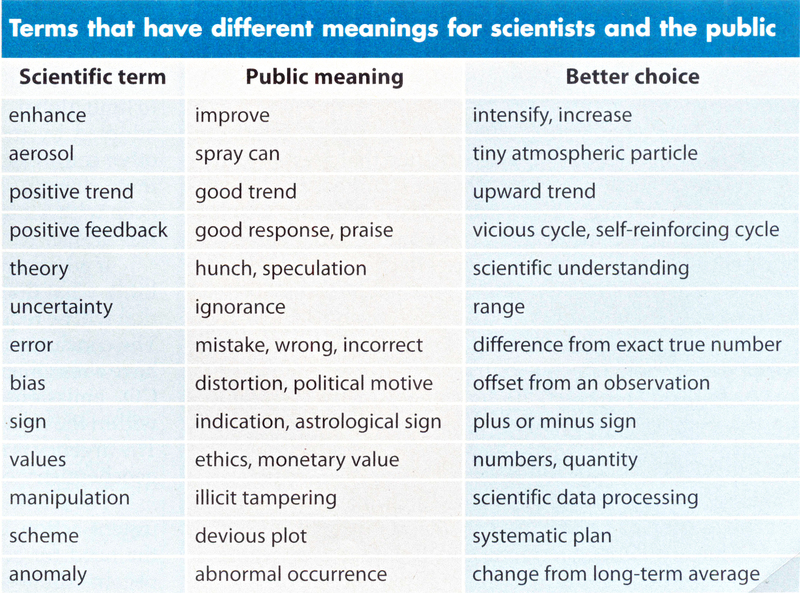 I’ll reproduce the table, which in turn was taken from the original paper entitled “Communicating the Science of Climate Change,” by Richard C. J. Somerville and Susan Joy Hassol, from the October 2011 issue of Physics Today. For future reference, when I use the terms in this table, I am usually referring to the meaning in the first column.